Climb aboard and hear the whistle blow! The Cuyahoga Valley Scenic Railroad is located in Northeast Ohio and runs through Cuyahoga Valley National Park, 33,000 acres of land that is part of the National Park System. The Cuyahoga Valley Scenic Railroad offers excursions year-round and offers an excellent view of the natural scenery and wildlife of the national park and an opportunity to learn about the history of the railroad in valley. Whether you are looking for a family trip or a company outing, the Cuyahoga Valley Scenic Railroad has something for everyone! CVSR is currently booking groups for January – April. *Group rates apply to groups of 20-70 passengers. 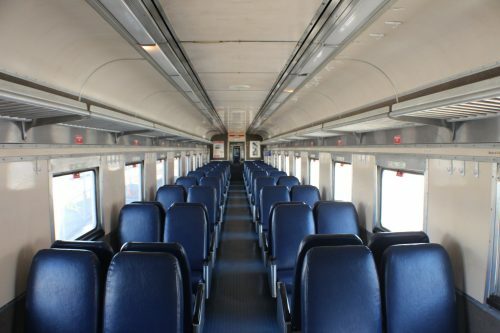 Coach cars offer traditional coach seats in sections of four, with two seats facing two seats. Our fully stocked concession car is made available to passengers riding on this train car. Outside food and beverages are not permitted on our train cars. Groups are seated in general seating. This is NOT a private train car. Prices reflect a 10% discount on full price. Added in addition to your total ticket cost. $11 per person, passengers select from a variety of sandwiches that come with pasta salad, non-alcoholic beverage, and cookie. CVSR will require a final menu and payment to be sent via email or mail 10 business days prior to the trip. Box lunch orders will NOT be accepted after this date. Box lunch orders must be completed in the designated formatting in accordance with our menu form and are to be submitted on time. It is understood that if CVSR does not receive a boxed lunch order require by the designated time, with payment in full, CVSR will cancel the order. CVSR requires 50% deposit 20 business days (1 month) prior to the train ride. If a deposit has not been received on or before the indicated due date, your tickets will no longer be held for your group and released to the general public for sale. A final payment is due 10 business days (2 weeks) prior to the train ride. At this time, a final head count of passengers is due. After this date, no refunds will be issued for reduction of passengers. Adding passengers is based on availability only! Upon receiving final payment, CVSR will email a confirmation letter to the contact and the contact may pick up tickets at will on the day of the trip with the ticket letter.We reserve the right to prohibit passengers from boarding if final payment has not been received. CVSR reserves the right to prohibit passengers from boarding if final payment has not been received. If it is less than 20 business days prior to a trip, groups must pay in full upon booking their trip. Group sales apply to passengers riding in parties of 20 to 70 passengers. Any additional passengers are required to pay full price. Groups must book 20 business days (1 month) in advance in order to receive the group rate and must pay in full upon booking. Groups will lose the group rate if passengers reduce the number of guests below 20 passengers at any time. No exceptions. Groups are seated in general seating. This is NOT a private train car. Group rates applies to pre-sale only. Additional passengers will pay the full cost of a ticket if purchasing a ticket within a 48-hour window of the day of the event. Excessive (more than 2) changes to your passenger count may result in additional fees. CVSR does not offer group rates on weekends, June through September. We do not offer group rates in October.